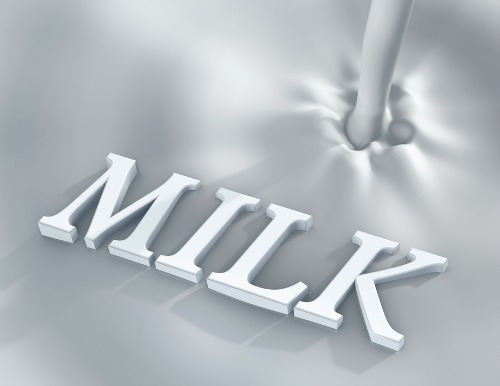 HWLH News Letter - Issue #004 -- Is Milk Bad For You? Issue # 004 - Is Milk Bad For You? I apologize first if this article seems a bit lengthy, but this is a topic I am truly passionate about and for those of you who struggle with this question I hope you find the contents of this page helpful. First of all doesn’t this picture make milk look so inviting offering a creamy texture and a totally satisfying look of approval? Of course it does, because this is good advertising and whether milk is bad or good it is a multibillion dollar business. So why do so many people drink milk? Well one very big reason is that is has been driven into our heads for generations, through the school systems, government food group pyramids and fantastic advertisements that say milk is very healthy for us and we should be drinking it every day. After all the government wouldn’t promote something that was bad for us, right? But here is another big reason people drink it. It is economically friendly, especially for larger families. They keep it reasonably priced so that everyone can afford to buy it. That is why high volume sales are so important and so necessary to keep profits up for this multimillion dollar industry. If we chose not to use milk and replace it with a substitute such as almond milk, well this can become pretty expensive especially for larger families, so for many people this is not even a reachable solution. Another reason people love to drink milk is that it makes breakfast time fast and convenient. Just grab a bowl of cereal and pour some milk on top of it and there you go, instant breakfast. Some folks don’t have the time to prepare a pot of oats or a fresh fruit cup, especially for parents that have a tight work schedule. This is why many people reach out for cereal. It is tasty, fast, filling and super convenient. Now back to the question: Is Milk Bad for You? I am not writing this article to dispute anyone’s thoughts, if you think milk is good for you I will not disagree. This article is important to me to share some experiences with you. Only two short experiences out of the many, I promise. A very close friend of ours kept experiencing kidney stones and issues with high cholesterol. He was in and out of the hospital often and his doctor also started him on medication to control his cholesterol levels. But what I found interesting is that one day his doctor asked him if he drinks milk and the answer was yes, in fact he used to enjoy about 3 – 4 glasses of it every day, he loved it. So reluctantly he stopped drinking milk altogether and amazingly enough his kidney stones never returned and his cholesterol levels dropped dramatically. I found it interesting that the doctor specifically asked him if he drank milk, as he knew it created these negative health issues. Next quick story makes me want to ask, Got Allergies? My mom’s best friend did and her sinuses were stuffed up for most of her life (years upon years). It always sounded like she had a sinus cold. Same story here as well. One day the doctor asked her if she drank milk and she too loved the white stuff and drank it religiously every day. After three months milk free her sinuses became totally unplugged and clear. It was truly amazing. So after watching these amazing recoveries it didn’t take me long before I started to ponder the question, “Is Milk Bad for You”? So far is seems like kidney stones, some allergies and sinus issues and cholesterol may all have some negative impact from that friendly drink of milk. Of course there are more negative studies about the effects that drinking milk has on the human body but each of these can be argued. For instance statistics have shown that the rate of osteoporosis is higher in countries that consume more milk. The more milk a country ingests the higher the rate. Yet again these studies can be disputed by factors such as genetics and how close that country is to the equator and so on. Fit for Life, A New Beginning by Harvey Diamond. Unlimited Power by Anthony Robbins. On page 183 it states “Too much protein has been linked continuously to osteoporosis, the softening and weakening of bones. The strongest bones on the planet belong to vegetarians. The Cure – Heal Your Body, Save Your Life by Dr. Timothy Brantley. Eating Alive, Prevention thru Good Digestion by Dr. Jonn Matsen is a fantastic read. This book also excludes any drinking of milk and you won’t find a drop of the white stuff in any of their recipes or meal plans either. There are many more books written by people who don’t believe that drinking milk is in our best interest. But this multimillion dollar business is strong and regardless of how many doctors, people or statistics are produced showing the negative effects of milk there will always be a few studies pumped out that will promote milk. These are usually financed quietly through the government. So the question still remains, is drinking milk bad for you? I think we should all be the judges for our own health by putting it to the test. The best way to test this theory would be to give up milk for about 4 weeks (or more) just to see what happens. Perhaps you will feel no difference at all, or perhaps you will feel like a new born person with extra energy to spare? Anyways, it is the only way one will know the answer to that all important question, is milk bad for you? By the way here are some of my favorite book picks on the subject, hope you'll like them too.